The RemoveDEBRIS satellite has successfully used its on-board net technology in orbit – the first demonstration in human history of active debris removal (ADR) technology. The spacecraft began the experimental phase of its mission on Sunday 16 September, when it used a net to capture a deployed target simulating a piece of space debris. RemoveDEBRIS was designed, built and manufactured by a consortium of leading space companies and research institutions led by the Surrey Space Centre at the University of Surrey. The spacecraft is operated in orbit by engineers at Surrey Satellite Technology Ltd in Guildford, UK. The project is co-funded by the European Commission. Professor Guglielmo Aglietti, Director of the Surrey Space Centre, said: "We are absolutely delighted with the outcome of the net technology. While it might sound like a simple idea, the complexity of using a net in space to capture a piece of debris took many years of planning, engineering and coordination between the Surrey Space Centre, Airbus and our partners – but there is more work to be done. These are very exciting times for us all." Ingo Retat, Airbus RemoveDEBRIS project head, said: "To develop this net technology to capture space debris we spent 6 years testing in parabolic flights, in special drop towers and also thermal vacuum chambers. Our small team of engineers and technicians have done an amazing job moving us one step closer to clearing up low Earth orbit." In the coming months, RemoveDEBRIS will test more ADR technologies: a vision-based navigation system that uses cameras and LiDaR technology to analyse and observe potential pieces of debris; the first harpoon capture technology used in orbit; and a drag-sail that will finally bring RemoveDEBRIS into the Earth's atmosphere where it will be destroyed, bringing its mission to a close. 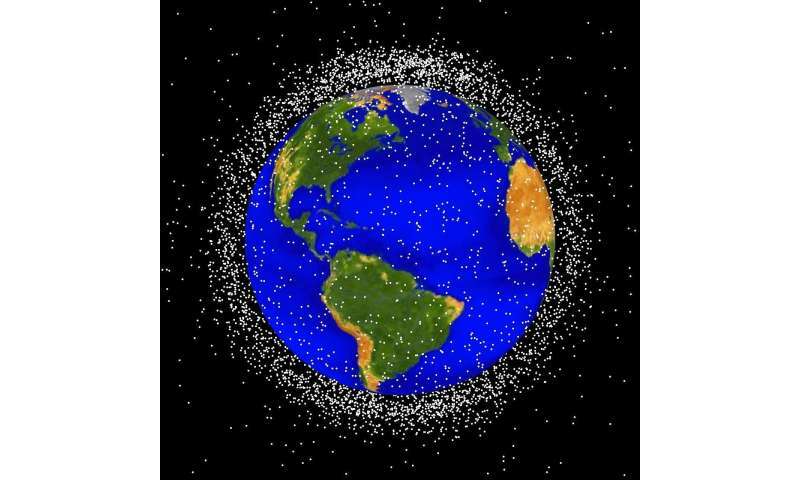 The US Space Surveillance Network tracks 40,000 objects and it is estimated that there are more than 7,600 tonnes of 'space junk' in and around Earth's orbit—with some moving faster than a speeding bullet, approaching speeds of 30,000 miles per hour. A flotilla of cheap robot/drone trawlers is the next step. Just haul the junk out of traffic and away from valued satellites. Nothing fancy or needing any special technology. LOL That first photo has got to be a shot of the dandruff dropping off jonesdave's head. But anyway, it is good that they have finally decided to remove those space-hazards to be recycled. Perhaps it will become really useful when Communist China sends up a satellite armed with lasers/projectiles aimed/pointed at non-Commie nations. segue, stop cowering, crawl out from under your mommies bed & get back to your middle-school history lessons. Stay awake long enough to pay attention to Neil Degrasse Tyson describing, how one single shot from one single armed satellite destroying one single target satellite? Would cause a cascade of destruction throughout all the other satellites in orbit! Including your own. There's no doubt, that you & trumpenella are stupid enough to shoot yourselves in the foot. I doubt if the Chinese leadership are that stupid. China is even more dependent on fragile orbital communications than the US. You remind me of the idiot commentator who raved that he would never listen to commie chink advice. So I asked..."If the Chinese Communist technician was trying to warm you not to exit an airlock without a p-suit? You would disregard & go out anyway? To prove that "Super White Patriot" could breathe vacuum? Explains why all you altright fairytails are brain dead! One down, 40000+ more to go... The hard part is the enormous volume the junk is scattered over, in wildly differing orbits.